January 2019 Veteran Spotlight: Christine Mason | Veterans Management Services, Inc.
serving in the US Army. In the midst of kicking off the new year, VMSI would like to honor Christine Mason for our January VetSpot! 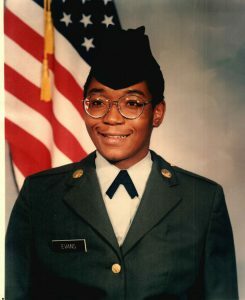 Christine chose to enter the U.S. Army to assist with earning her bachelor’s degree and as a way to support her son as a single parent. The Army is a family affair for Christine, with her son serving for 8 years in the E-4/SPC Infantry and her father serving for 22 years and retiring at E-9 Command Sergeant Major – Military Police/Corrections Officer. While serving in the Army, Christine provided support as a lead Unit Supply Specialist on a deployment to Bosnia for 13 months. She was also stationed in Germany and was assigned to the S-4 in a Command Support Group. She enjoyed her duty station of Bamberg, Germany, where she lived for three years. Christine currently supports our VA Central contract in VISN 15 and we have received exceptional feedback from the client outlining her positive attitude, eagerness to learn, and ability to quickly shift focus for pressing projects. It’s clear that she obtained critical skills during her time in the armed forces and she continues to excel in civilian life as well. Research and understand the benefits available to you through the federal government and other organizations. Sign up for medical benefits immediately upon separation through the (VA) Veterans Administration. Ask questions before transitioning to understand what to expect. Start college immediately using the GI Bill, which can be used toward tuition and living expenses. Thank you for your service, Christine, and for sharing your experiences with the #VMSIFamily!